I do Christmas cookies every year. I do them pretty seriously for my friends, colleagues, employers, postal workers, and I know they are appreciated. After 6 years off practicing baking en mass I know how to make a lot of cookies without losing my cool. 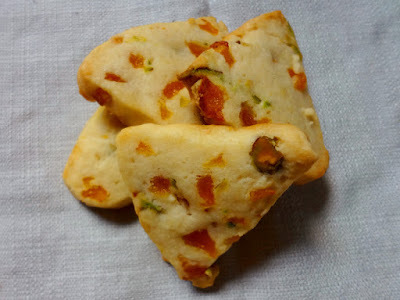 This year I decided not to do any of my regular cookie recipes. I trust my skills, kitchen, and ingredient knowledge. I have a mental picture and flavor palette of exactly how I want my Christmas cookies to be. I want my Christmas cookies to include all the flavors, sizes, colors, and shapes that amplifies everything that I find wonderful about the holidays. To repeat myself, I take this seriously. 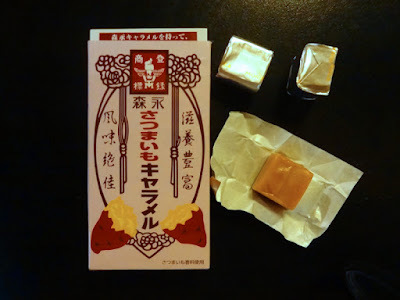 Sweet potato caramels are really good and a really good idea. Hey look! 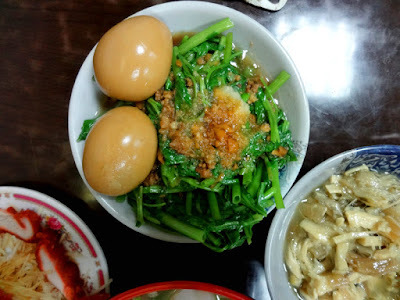 Its all the really interesting food I ate, laughed at, choked on, or generally marveled over while in Taipei, Taiwan that didn't find a real place in any of my blog posts. This also marks the last of my month long trip photos. After today I will switch to holiday baking and my winter CSA. Mos Burger is Japan's idea. They ask why not use grains of rice to make a hamburger bun. The answer is yes rice should be a hamburger bun. At Mos Burger, a fast food chain, you can get all kinds of hamburgers, and fried chicken is a side dish like French Fries. Pumpkin ice cream. I saw it, but didn't try it. Ice cream stuffed in little pumpkins. Sounds right to me. Another essential Taiwanese snack. Sweet waffle/crepe batter filled with bean paste. 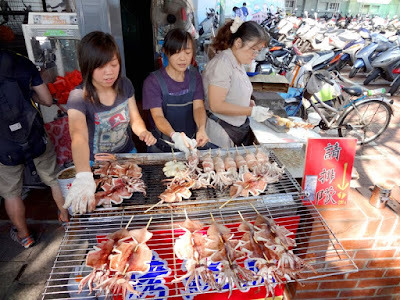 Often made from the small stands on the street in cast iron molds, much like squid balls. I'm going out of chronological order! I'm not even in Taiwan! I just want to share all the cultural specialties I plowed through for your benefit. I was thinking of all of you, my dear food craving readers while I ate such dishes as stinky tofu. Stinky tofu is quintessential Taiwanese comfort food. 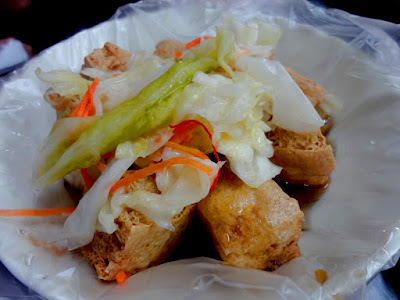 Fermented tofu served sauteed or fried. It reeks to high heaven with a sharp scent. You know it before you try it from all the carts stinking up the street. They will tell you that it does not taste like it smells, but it does it does. It smells and tastes like a wet dog that's been rolling in overly ripe cheese. The distinct flavor strikes a special cord with anyone who has grown up on it. I was proud that I didn't have any problems putting it in my mouth, chewing it, or swallowing it. Its not offensive, just boldly different. Believe it or not the following meal happened on after all the goodness of of Tamsui. I am the energizer bunny of eating, but without the ears or drum. I really have 3 or 4 more meals and items that belong on this blog. I am in America now, but everything that happened in Taiwan is much more interesting than my own food experiences here. Don't worry, we will get to Christmas cookies soon enough. So the night market in Gonguan is very near a university, and has a youthful vibe. I sat down to this meal with my ultimate hosts and they ordered all of their favorite dishes. It was one of my favorite meals. Lets take a look at why. Ground beef. Yeah, I know. Its the easy solution in any culture to hardy, comforting deliciousness. Here we have something called marinated ground beef, or as I like to call it Chinese Hamburger Helper. Chinese Hamburger helper pretty much says it all. I inhaled this. It was superb food. I had been reading about a magical place near Taipei called Damsui. A seaside town for biking, an nearby island for hiking, and LOTS OF SEAFOOD. I was perplexed because I couldn't find Damsui on the map. Reason: they changed the English name from Damsui to Tamsui weeks before I arrived. This makes no sense. Its still pronounced Damsui, but will forever on be known as Tamsui. Its accessible by the Taipei subway system only 45 minutes or less. Go there if you're in Taiwan. Its nice, and the food is wonderful. I visited Tamsui on a bright, bright, extra sunny day. One of the first sunny days on my trip. As a rule all museums and attractions are crowded on weekend. Once you're used to the bustling of crowds the relaxing slower pace and people watching forgive the lack of space. I was with a group of 6. A boon to all the new street foods. The more people you have the more variety you can nibble on.